A citizen speaks out at the May 19, 2016 Association of Bay Area Governments Regional Assembly. He questions the legality and constitutionality of "regional government" where citizens don't even know about the meetings. Scott Haggerty, Alameda County Supervisor responds to quiet the citizen (peasant) citing privilege of elected office. CityBldr will start buying up homes and breaking up neighborhoods with their development tool. Seattle startup CityBldr is getting into the home buying game, taking on real estate heavyweights in its backyard. But unlike Zillow and Redfin, which have both started buying properties directly from homeowners, CityBldr is targeting homes that can be converted into multi-family residences. CityBldr’s software identifies underutilized land in cities, like Seattle, and makes connections between homeowners and developers to repurpose properties. 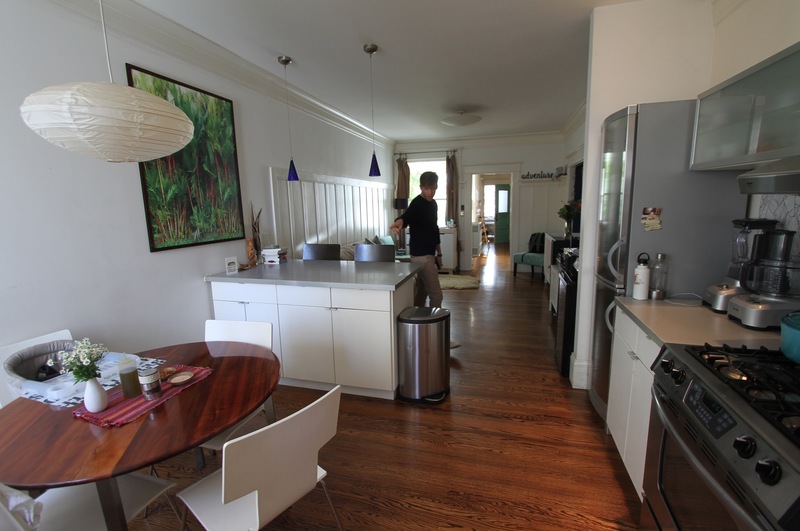 For example, CityBldr helped seven homeowners in the Seattle area realize that if they sold their properties as a bundle to a real estate developer, they could make more money. Going forward, CityBldr will start buying properties like those directly, then sell them to builders and developers who will convert single-family homes into multi-unit residential buildings. CityBldr will start buying houses sometime in the fourth quarter of 2018 or first of 2019. The startup is currently raising its Series A round and searching for a Chief Investment Officer to oversee the home buying business. Copley says that CityBldr should be able to guarantee a higher price on properties it targets because the resale value to real estate developers is higher than the listing price for a home that would be resold as a single-family residence. “The reason we’re able to do that is we’ve built a tool that understands the development potential of every property … Instead of only looking at what would a homebuyer pay for that property, we look at what would an investor or builder or developer be able to pay for that property,” Copley said. CityBldr is taking a different approach than Zillow, Redfin, and Opendoor, the incumbent instant offers company based in San Francisco. Opendoor just raised a whopping $325 million to expand into new markets and defend against new challengers. Unlike CityBldr, all of those companies are buying homes to sell to other home buyers, not brokering deals to convert properties into multi-unit buildings. Eric Dreikosen, Marinwood CSD manager on June 12, 2018 when he denied the existence of a pending application for Marinwood Maintenance facility on June 15, 2018. His deliberately misleading statement was continued in this email exchange below. Even at the June 26, 2018 Parks and Recreation meeting, the application was kept secret. Finally, it was revealed on Friday, June 30, 2018 at 5 pm before a major holiday. A legal notice was published on Saturday, July 1, 2018. Clearly the Marinwood CSD will go to great lengths to keep their activities secret. 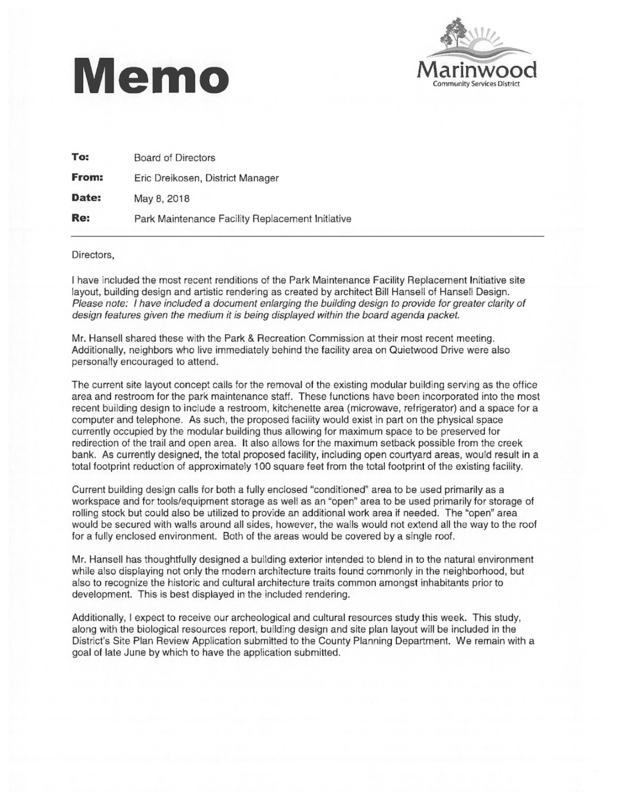 At the June 12th Marinwood CSD meeting, I asked Eric Dreikosen about the pending application for the Marinwood Maintenance shed. He answered evasively to imply no actions with the permission of the board . Several days later on June 15th, he signed and submitted a 109 page "Neg Dec for Environmental Review that will allow the Marinwood CSD to build WITHOUT CUSTOMARY ENVIRONMENTAL OVERSIGHT. This particularly upsetting since the current Hansell design calls for a massive 4400 square foot compound that is 100% within the stream conservation setback of 120 feet. However, since Marinwood CSD is their own oversight "lead agency", of course they will approve their own work. What day will you submit your application for the Marinwood Maintenance Facility? Previously, you mentioned that you hoped to have an application to submit in late June 2018. What day will you submit and meet with the planners? Who is the county planner for this project who is assigned to your project? Editor's note: Notice that I did not specify which application. An honest answer would have been that a 109 page NEG DEC EIR document had been submitted three days earlier. The District does not have a set date as to when the Site Plan Review Application will be submitted. As no such application has yet been submitted, there has been no planner assigned on behalf of the County. 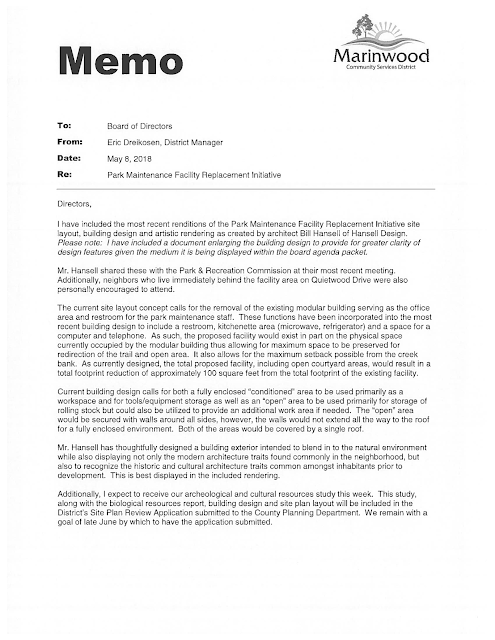 UPDATE 7/7/2018: Eric Dreikosens own May 2018 memo indicates that a Site Plan Review Application will be submitted at the end of June (see the last paragraph). Suddenly, Eric Dreikosen is having amnesia and calling the document something else. This is a deliberate attempt to deceive the public. We deserve to have employees worthy of trust. Approximately, when do you think the submission will occur? Is it still the end of June or has their been a delay? Will you please notify upon submission? The District continues in its due diligence with the pre-planning process. With that, I do not have an approximate date as to when the Site Plan Review Application will be submitted. All proper notices will go out at the appropriate times as we move forward with this initiative. Editor's Note: Dreikosen continues to mislead me. He knows that I want to engage in productive dialogue but still conceals his actions. Thanks for your prompt reply. There was a promise of a public meeting prior to submitting the application at the last impromptu presentation. Is this part of the due diligence that you are referring too? I know the public wishes to engage with this topic and the best way is to be transparent. I hope to minimize the unnecessary misunderstandings prior to submitting so the district can save time and money on the project. 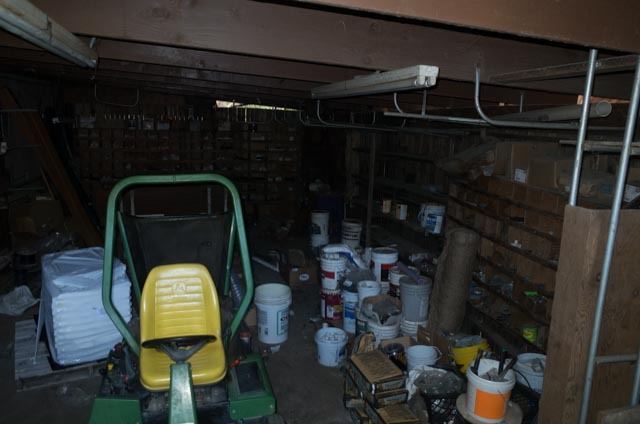 The current iteration of the Maintenance Shed project has many challenges. The first challeng is establishing a policy of what activities can take place on the site. The current landscaping waste, materials depot and haphazard storage of materials and equipment is a relatively recent phenomena. 1.) Will this be allowed in the future? 2.) Does the structure serve the practical applications envisioned? I don't see how the current large, long narrow building could practically accommodate the practical needs for tools, vehicle and materials storage plus a workshop and office. The workflow access is severely constricted by design. A conventional long garage such as one used in virtually every other government facility in Marin County will overcome this obstacle. The current design is definitely more attractive but due to its inefficient design, it will encourage the use OUTSIDE the building which defeats the purpose of a self contained facility. Of course a budget should be established too. I believe the first two questions should be answered PRIOR to submitting a plan since changes will significantly alter the site plan and could cause delays. The environmental issues will still need to be addressed but at least we can get the first important questions answered first. I have long lobbied for a new maintenance facility and glad it is finally being addressed. Let's do something great. The following needs assessments and considerations, once reviewed, finalized and approved, will be used by the selected design professional and implemented into final design of the facility. majority of maintenance work is performed (Parks, Pool Complex & Buildings). allow for vehicle access, turn-around, loading/unloading, trailer hook-up, etc. and pedestrian traffic, users of park, associated facilities and other District operations. 4 Environmental: Park parcel = environmentally sensitive area with creek/watershed, natural areas, etc. Minimize impact as much as possible. Coordinate with various regulatory agencies. 6 Infrastructure: Consider and leverage existing infrastructure (water/sewer/electric) as much as possible. professional while addressing needs as described herein. Vehicles: Full size maintenance truck (F-250 super cab with extended bed). Other Vehicles: Riding mower; utility vehicles (x2). drill press, landscape maintenance equipment (weed whackers, blowers), hand tools. Parts & Supplies: Plumbing, Painting, Electrical, Irrigation, various screws, nuts, bolts, etc. Lumber: Limited supply kept on-site for quick fixes (2x4's, 2x6's, 1x6's, plywood, etc). Chemicals: Limited quantities kept on site including gasoline. Requires specialized storage. 3 Workshop Area: Space for equipment maintenance and special projects as well as workbench(es). 4 Desks/Office: Dependent on location. Current location allows for continued use of modular office. restroom(s) for staff, water/sewer, electrical power, phone line, internet connection. possible as determined by design professional. 6 Electricity: Conveniently located power outlets throughout. 110 and 220? 7 Lighting: Ample interior lighting needed. Consider optimal use of ambient lighting in addition. 8 Water/Sink: Shop sink(s) in addition to plumbed eye wash station(s). The real problem with the shed is the lack of organization and light. 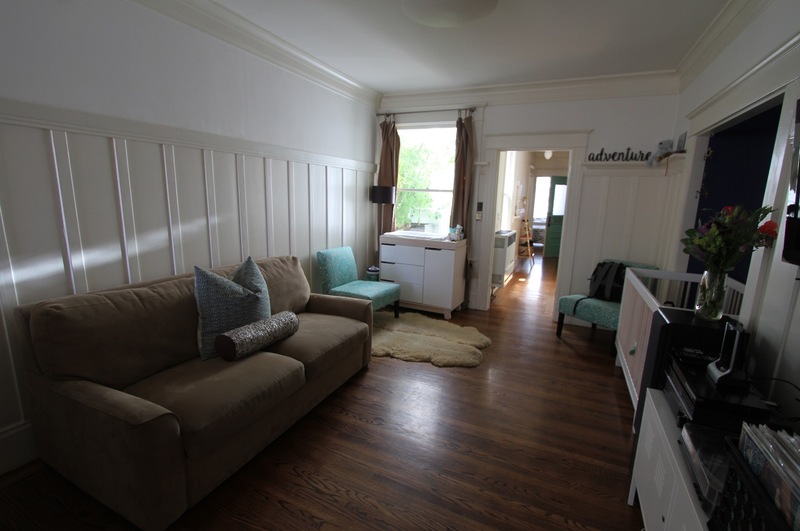 10 HVAC/Ventilation: A/C not needed. Heating is needed. Insulation needed. Proper ventilation needed. should also have capability to be used as workspace for projects not suited to indoors. Consider retractable or removable structure to protect from elements, rain, etc. Suggest 8' tall fencing for security. nearby residences depending on facility location. 3 Material Bins: Storage of commonly used materials such as gravel, wood chips, sand, etc. Potential to contain within Yard otherwise will need to be placed in immediate vicinity. 4 Electricity: Outlets placed outside to eliminate need of large extension cords running from inside. Incredibly, after building a 4400 square foot compound surrounded by 8 foot walls, they suggest storing material bins , dump truck and trailer OUTSIDE the facility? Come on! Has anybody really thought this through? The existing footprint will DOUBLE and yet we still have on a 3 person staff managing about six acres within the 14 acre park. 2 Building Type: Premanufactured versus design and build-to-suit? TBD based on form, function, cost. 3 Aesthetics: Blend with surrounding environment and not seem out of place. maximize space. Reduce noise impact as much as possible. Workshop: Standard door to outside for pedestrian access. Yard: Sliding gate in addition to doorway or garage door to yard area direct from building. foot of driveway entrance (existing location already has gate in place). Editor's Note: Here are examples of professional grade shop organization. There is no need for a massive shop. Shop organization is essential for efficient workflow. Will Government Pensions Destroy Illinois (and will California follow) ? Will History Record Illinois As A Failure Of Democracy? For Independence Day, it’s right to consider the most far-reaching questions raised by Illinois’ crisis. Did the Founding Fathers miss something? Did we miss something the Founders stood for? 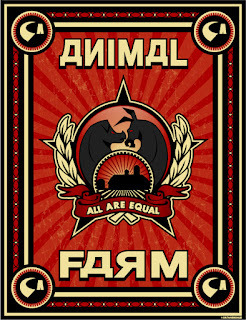 Is our form of democracy fundamentally flawed? The importance of those questions is part of why Wirepoints exists, and why we hope other states follow Illinois’ story. The reasons are myriad. Many are debatable. Some are particular to Illinois. Most of the 20,000 articles we’ve linked to or written on this site are about those reasons. But on the overarching question of universal importance — whether Illinois has exposed some fundamental flaw of democracy — the story hasn’t ended. Nobody knows how Illinois’ crisis ultimately will sort out, but there is reason for qualified, partial optimism, albeit over a long time with much pain in the interim. That optimism derives from the likelihood that much of our crisis will be resolved in courts — federal courts exercising their place in the federal system we inherited — and the hope that those courts will honor the foundational principles of American government. The Founders’ foresight, not their failure, perhaps may yet shape Illinois’ history. Perhaps. The initial questions that might end up in the federal courts have already gotten some attention. If Illinois amended its constitution to delete its pension protection clause, would the United States Constitution’s Contract Clause still prohibit pension reform? Could the federal Bankruptcy Code be amended to allow bankruptcy for states? Could some other form of federal legislation authorize adjustment of pension obligations? And if Illinoiseventually authorizes bankruptcy for municipalities, which is probably unavoidable at some point, many questions about that process remain unanswered by courts. More fundamentally, it’s only a matter of time before a federal court faces a situation somewhere in Illinois where essential, basic government services fail. A court will face a “police power” question, as it’s called. Illinois courts have frowned on the concept but federal courts recognize it in exceptional circumstances such as those Illinois eventually will face. It’s that concept that I suspect will become central and will be recognized in some fashion, whether under the label “police power” or otherwise. Government must function. Though the Illinois Supreme Court has essentially read the state constitution to be a suicide pact, permanently committing the state to insurmountable pension obligations, federal courts, I hope and expect, will see things differently. Perhaps they will even give life to the Guaranty Clause in Article IV of the United States Constitution. Through it, the Founders affirmatively obligated the federal government to guaranty to every state a “republican form of government.” Never mind what “republican” means for now. We’ll come back to that. 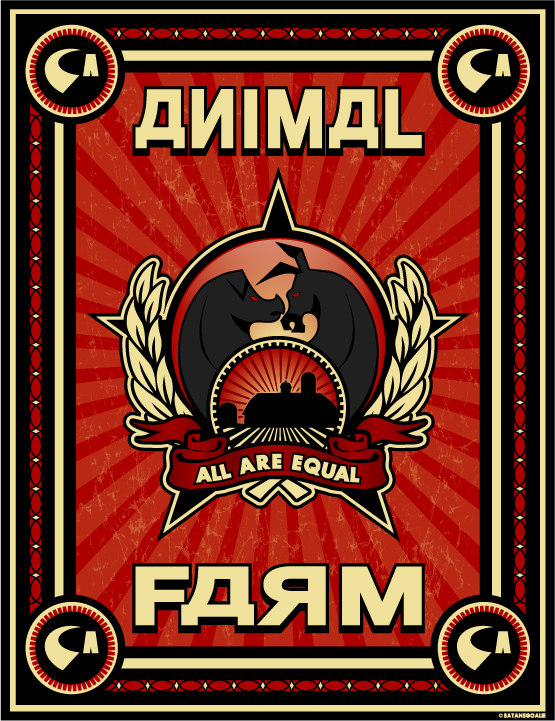 At a minimum, it means a government of some kind. If basic services truly fail, federal courts will seek to restore them. They will find a way, and the Guaranty Clause would help if it were honored. A conspicuous portion of the Janus decision handed down last month by the Supreme Court is pertinent. The majority of the court seemed to go out of its way to describe Illinois’ financial problems. Because they are so grave, the court held that the First Amendment prohibited forced union membership because a member should be free to advocate as he chooses on them. “To suggest that speech on such matters is not of great public concern is to deny reality,” the Court said. The depth of Illinois’ problems, in other words, influenced the Court’s ruling on the First Amendment. So it will be, I suspect, on other Illinois matters ending up before the Court. Did the Founding Fathers indeed leave that issue unaddressed? No. but their check on it has faded away. The Founders didn’t believe in democracy. They all believed in republicanism — indirect democracywith firm protections for minorities that trump simple majority rule. Republicanism, they believed, provided the check on tyrannical majorities. We haven’t kept it. Illinois government wields unchecked power incompetently and voraciously. Homes, particularly in lower income communities, have been confiscated by absurd property taxes used to pay pension promises that were awarded through legislative incompetence and legal bribery. Unfunded mandates became ubiquitous, making the simplest fiscal reforms impossible for municipalities. Legislative maps drawn by legislators let politicians pick their voters instead of the other way around. In short, statism replaced republicanism. The coalition majority in Illinois became rapacious and tyrannical, exactly as the Founders feared. Undoing the power of that tyrannical majority in Illinois, however, will be difficult. Federal courts cannot be expected to do it alone because so much of that coalition’s power has become institutionalized, in contrast to the republic the Founders envisioned. The job will be left to the electorate and, in Illinois, the majority of the electorate has shown little understanding of the nature and depth of the state’s problems. So, has democracy failed in Illinois? Yes, but don’t blame the Founders or their vision of government. Maintain a degree of optimism that federal courts will end up enforcing constitutional checks the Founders gave us and hope Illinoisans eventually will see fit to endorse some state version of the foundational principles the Founders believed in. Editor's Note: A special thanks to Marin County's own "Citizens for Sustainable Pension Plans" for bringing this excellent article to our attention. 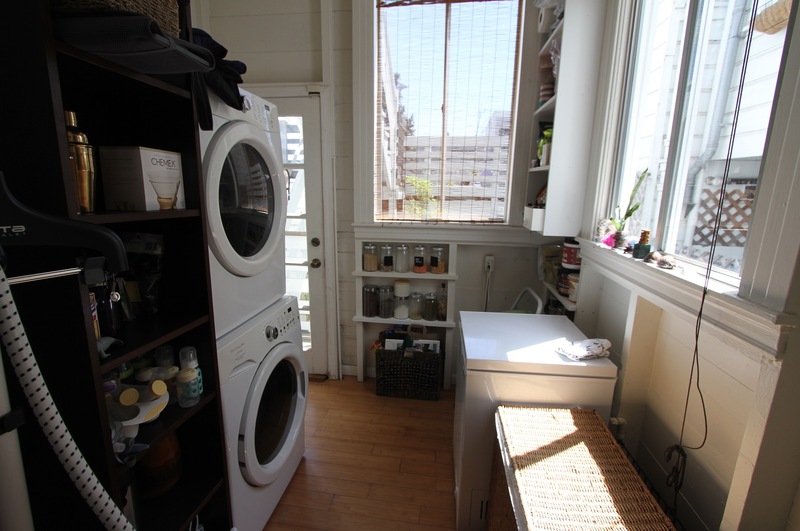 My neighbor bought her one bedroom apartment a decade ago for what seemed like the outrageously high price of $400,000. Today the place is worth $900,000. 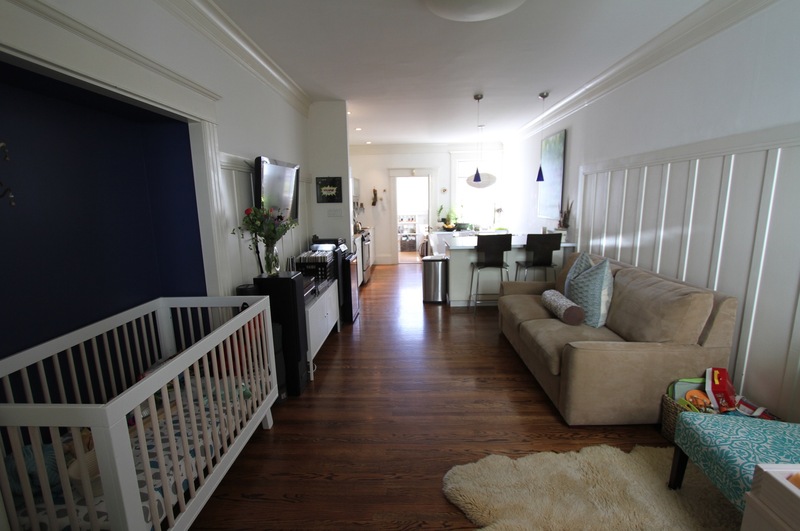 Now that her and her husband have a child they need more space and were confronted with the reality of what it would cost to upgrade to a slightly bigger place with a patch of garden. The numbers didn’t add up. Moving to a suburb anywhere in a two hour drive of San Francisco didn’t help since the price of anything approximating what they want is insane, and the vaguely “affordable” options were horrifying for a long list of reasons. Hence the 3,000 mile move to Massachusetts. 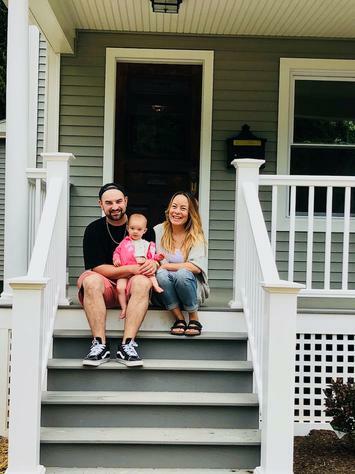 The median home value in their new place is $280,000 – and they’re getting a big fully renovated Victorian era home on a third of an acre. 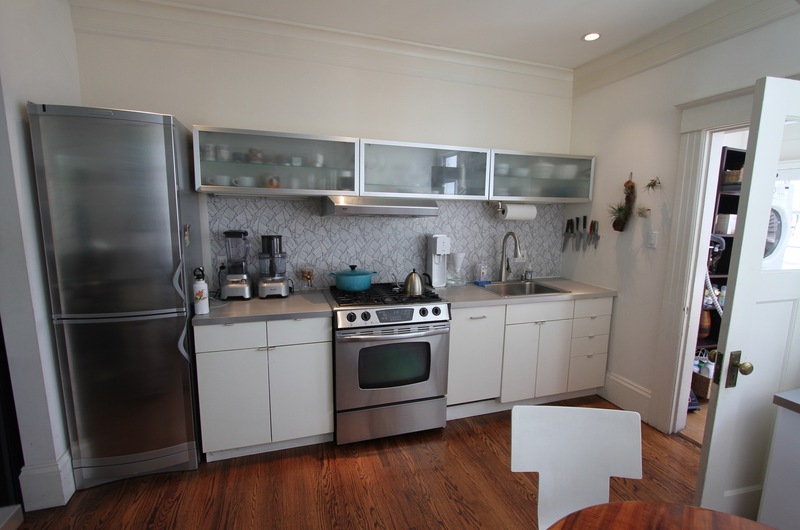 The question now is whether to rent the old apartment or sell it outright. Holding it will provide a steady rental income that will cover all their expenses in Massachusetts. Selling it will provide a lump sum of cash that will allow them to live mortgage free in their new home and have plenty of money left in savings. They still haven’t decided. For the moment my neighbors are absorbed with the quotidian concerns of moving house and settling in to their new place. I’ll note that while they definitely wanted more space and a garden, they also wanted to be in a town with a Main Street and other “urban” amenities close at hand. 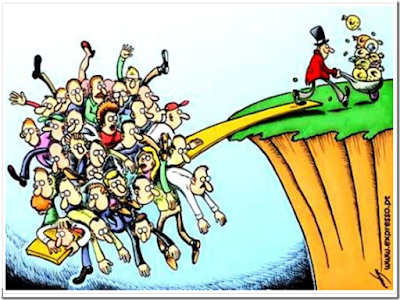 I see this repeatedly with my millennial friends as they have children and migrate away from the city. They want an older neighborhood close to a smaller version of what a city offers. It doesn’t need to be San Francisco. But it isn’t all Burger Kings and Jiffy Lubes either. Editor's Note: This is Northampton, MA I surmise. Great place to live. Since 2011 Marinwood CSD has been taxed for Paramedic services that it has never received. The Marinwood CSD Board of Directors do nothing while our community is being ripped off. Why are we continuing the tax? Here is a recent resolution by the City of San Rafael. 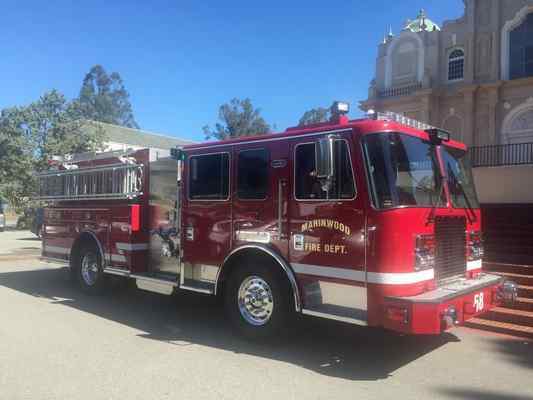 If you or a loved one had an ambulance response, you will notice that you received a huge bill sent to you by San Rafael Fire Department. This is a tactic used to collect extra from Medicare and your insurance company. How toxic soil vapor will be removed if Casa Marinwood residents speak up. Toxic soil gas needs ACTIVE clean upat Marinwood Plaza to protect neighboring Casa Marinwood from the toxic soil vapor that the owners want to leave in the ground to dissipate gradually. Active soil vapor extraction should commence immediately. Marinwood CSD will approve its own EIR. What are the chances they will reject it due to non compliance? The Marinwood CSD has given itself authority to approve its own "Negative Declaration for Environmental Review" for the Maintenance Shed. It is quite funny, because in recent years, the Marinwood CSD has claimed that it has no authority over land use decisions (true) and cannot comment on land use policies that affects the Marinwood CSD or its residents (bold face, "untruth"). The Marinwood CSD, filled with political pawns of a former supervisor, helped engineer the identification of seven huge affordable housing complexes in Marinwood. During the 2014 housing element 85% of all of the affordable housing for unincorporated Marin County were targeted for Marinwood-Lucas Valley. If the projects go forward, it will swell our population by 50% while the properties will be tax free, further burdening us with their share of taxes. Likewise when it was discovered that Marinwood Plaza had a toxic waste issue and residents in Casa Marinwood and neighboring properties were severely affected, the Marinwood CSD refused either to listen about the problem, officially or unofficially endorse clean up efforts because "the CSD doesn't comment on land use issues". Marinwood CSD Board members have REFUSED to even comment on the deadly toxic waste problem at Prosperity Cleaners. Even today, while the toxic waste issues are still present and threatening residents, neither the Marinwood CSD as a board or any individual member will support clean up efforts either officially or unofficially as a concerned neighbor. (Editor's Note 7/12/2018: Correction Bill Shea signed the Change.org petition. My apologies ) The duplicity continues with the Parks and Recreation commissioners who will not support toxic waste clean up. Of course, if you want to plant native species, they are all ears. The environmental practices of the Marinwood CSD are atrocious. 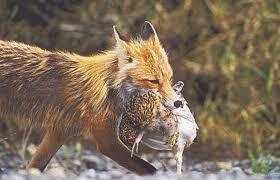 They have regularly destroyed wildlife habitat EVEN WHEN EASY ALTERNATIVES exist. Most of the environmental damage in the park is caused by reckless policies that ignore environmental laws and common sense. For example, when Miller creek flooded, the parks department dropped chunks of concrete in the stream bed without appropriate engineer and environmental controls. The CSD used/stored strong pesticides for years after their use were no longer accepted practice. 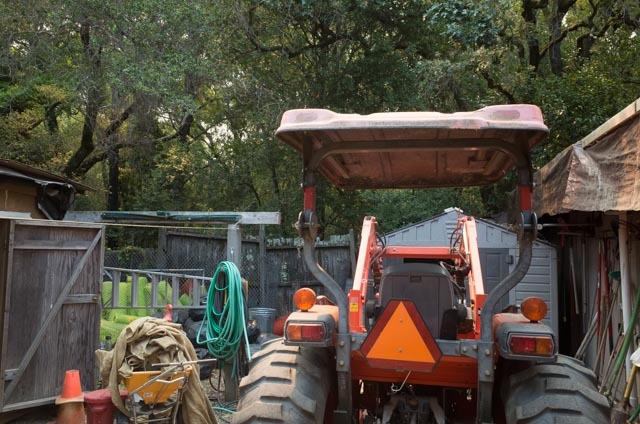 The parks department also bulldozed landscaping debris and trash into the storm drainage canals and were forced to clean it up by Marin County agencies. Marinwood Parks abuse the natural landscape with heavy equipment despite easy alternatives. So it is quite laughable to have Marinwood CSD be in charge of its own environmental regulation for the maintenance shed. It is like the fox guarding the hen house. Nevertheless, unless challenged by the public or a higher authority, the Marinwood CSD will be allowed to declare itself "in compliance" with environmental regulation. How many private individuals would like to be able to "self report compliance" ? So it looks like Marinwood Park will have the "Taj Mahal" of parks maintenance sheds that no other community in Marin County will have. They most certainly will be spending the most money, occupying the most space of any 3 person parks department in all of Marin, perhaps all of Northern California. Who can you thank for this debacle? The Marinwood CSD directors including Leah Green, Bill Shea, Irv Schwartz, Jeff Naylor and Izabella Perry and Marinwood CSD manager Eric Dreikosen. Former CSD director, Bill Hansell is the architect but who can blame him for maximizing his "opportunity"? Ultimately, we are the ones who elect these people and allow this to happen. After hundreds of thousands of dollars are wasted at the Marinwood CSD, guess who picks up the bill? 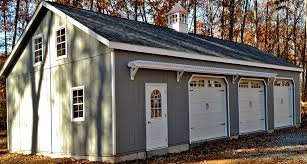 Any one of these sheds could house our 3 person Maintenance Department (one truck, two golf cart trucks and a tractor) with some modifications Instead the Marinwood CSD wants to spend hundreds of thousands of dollars on custom design that is FOUR TIMES the Size and ten times the price. 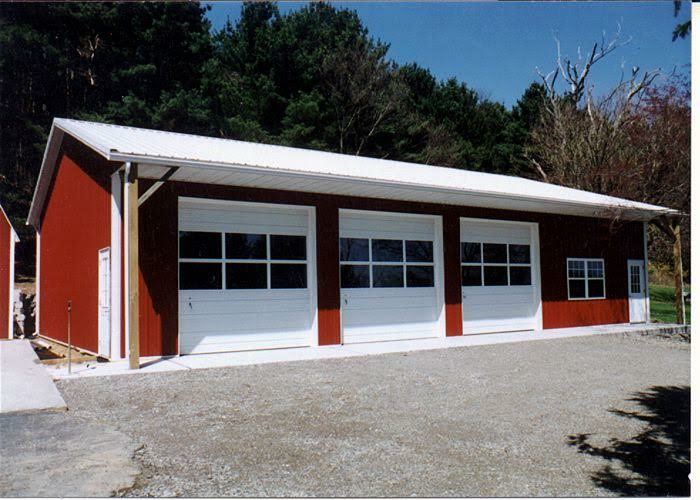 Pre engineered Sheds like the above start at $10,000 installed. The architects fees for the Marinwood CSD project have already exceeded the cost of a prefab unit. I'd rather see us use the hundreds of thousands wasted on a custom design to be used for improving our parks and paying down our pension obligations. I do appreciate good design but think it should be concentrated on the public areas of the park. What do you think? In 2017, the Parks and Recreation commission held a workshop to gather public feedback on a new maintenance shed. The Marinwood CSD subtly tried to push its preferred design but were surprised at the amount of community concerns about the size, location and cost of the new facility. 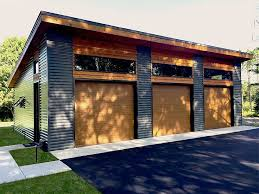 There were three locations discussed including one next to the fire station and at the end of the meeting, the CSD board promised to "take the feedback in for a future proposal"
Instead in 2018 the Marinwood CSD decided to ignore the public altogether and only informed five neighbors of the new design proposal. The meeting was deceptively noticed as a discussion but instead it was an hour long presentation by the architect, Bill Hansell to lay out his plans. I happened to attend the meeting to present a concern to the Park and Rec Commission and had a chance to film the meeting. The Marinwood CSD openly violated Brown Meeting Act "Sunshine Laws" so they could escape public scrutiny. 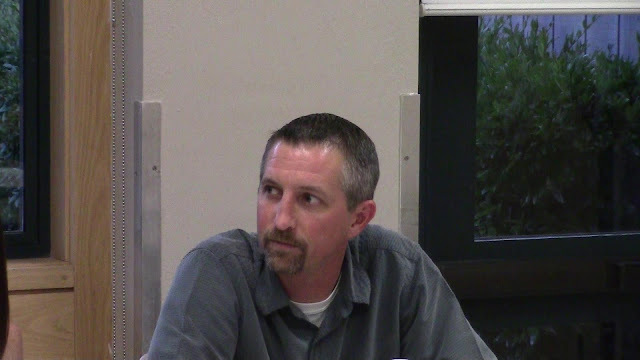 At the June 12, 2018 meeting, Eric Dreikosen, CSD Manager was asked again about the submittal of documents for consideration and he evasively answered the question to make it appear that nothing was happening. Three days later on June 15, 2018 Dreikosen submits a 109 "Negative Declaration for Environmental Review" which essentially gives the Marinwood CSD a free pass to build with minimal environmental review. He continued to hide this from the public until Friday, June 29th with a cryptic note before a major holiday and when Marin County workers were threatening a strike. A required public meeting was scheduled at the most inconvenient time possible shortly before comments are due on the plan. Clearly neither Eric Dreikosen, the Marinwood CSD Board or Parks and Recreation members wants the public to interfere with their plans.-- AS IS OUR RIGHT IN A DEMOCRACY.